Last weekend was a little hectic. I had to cover 2 areas because this weekend I am heading off to Poland to spend Easter Polish style with my SVG and her relatives. It was also made more challenging with the additional presence of my kids, but I had foreseen their lack of enthusiasm by making sure that they brought their scooters with them for starters, although I still knew that it would not be easy convincing them about the walks unless I could promise them something of interest to them, some of you might call it a bribe. I on the other hand prefer the word encouragement. The bait or motivation for this walk was the Army museum though in the end we never managed to get there but I found something else to occupy their imagination. Zizkov is one of those areas where all creatures great and small can be found roaming in its streets. It is cool and trendy and yet basic and mysterious. It has a unique magic. It can be compared to the atmosphere of the movie Moulin Rouge, well that is the best way that I can describe it. Some interesting facts about Zizkov are that its name is connected to a well renowned General who was known for being quite ruthless. It was a part of the old city of Kralovske Vinohrady before becoming a town in its own right and later as with Kralovske Vinohrady was encompassed in the city of Prague. This area, and we have just started looking at Zizkov, has incredibly over 300 bars and restaurants. We took over 300 photos in this first area, my camera was full and I had to delete some older photos so that we could continue, only later to have my camera's battery die on me. If you are looking for some more impressive information, Zizkov is home of the world's 2nd most ugliest building, any guesses? and largest horse monument to boast of. Our first pit stop was going to be the interestingly titled Planet Zizkov but it looked like it was undergoing some restorational changes, so we went to another Czech restaurant close by, because the kids were hungry and there is no warning for this when it happens so you just have to drop everything and pray that you are close to an eating establishment, which we luckily were in Zizkov and as I said before there is no shortage of places to eat and drink. It may seem that I have a thing for cellars but I think that it is also a Prague thing, because if I had to name 10 places that you have to walk down to get into them, I would have no trouble doing so. Surprisingly they had a daily menu on a Saturday, so we chose from that, but they also had a quite extensive food menu as well, which my daughter ate from (chicken breast topped with cheese and ham ) and judging by the lack of remains on her plate, thoroughly enjoyed it, apart from the sunka that is, Kids!. We had no major complaints about the food. My SVG had a tomato and mint couscous with tzatziki, which she expected to be warm, but in fact arrived cold and in her words "It was so so". I had the Chilli con carne, which was spicy and surprisingly for me made with stewing beef rather that mince, though it went quite well together and I had no problems polishing it off or next week I suppose I will be Polish-ing things off. The staff were polite and quite attentive and having the kids is always a great way to test restaurant staff's patience and my 2 are experts in the art of testing people's patience. The food was also reasonably priced and it would be fair to say that we would go there again. Our last port of call was a cukrana called Marmelada. 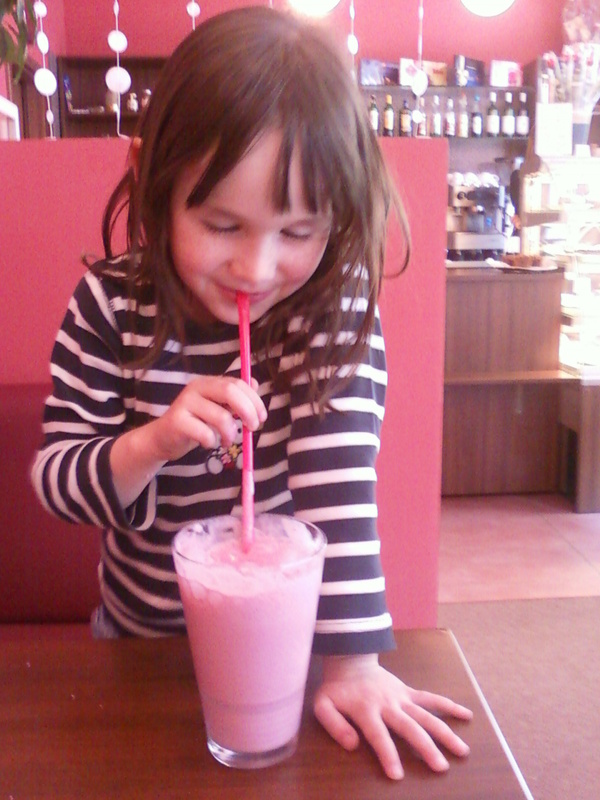 My daughter wanted to have a milkshake, so after 90mins of asking and she can ask and ask and ask and ask, believe me, so finally we were relieved to find this newly opened Cukrana and we believe that the owners were Italian though we could be wrong but they were definitely not Czech. 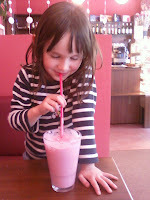 I didn't join them for cake and milkshake because I had to retrace my footsteps, as I said earlier we had a few technical problems with batteries on the cameras, mainly to do with the quantity of photos we ended up taking and also the ones that my kids took. When I came back the cakes had been demolished and the shake which was the main reason for going had not been finished though having a little sip myself I can say that it had nothing to do with the quality of the shake because it was made with fresh strawberries but more to do with my kids playing with a green and a yellow smiley face ball on the wall near to the toilets. 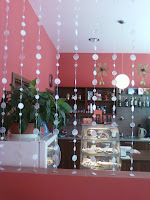 We have to say that we really liked the place and would recommend it to people who enjoy nice cakes and coffee with friendly and welcoming knowledgeable owners/staff.